About one month ago, Jamie Leeds and business partner Sandy Lewis opened CommonWealth Gastro Pub in the up and coming (or perhaps already came) Columbia Heights neighborhood. Conveniently located at the top of the steps of the Columbia Heights metro, it's an quick metro ride from anywhere in the DC area. For a "pub", CommonWealth is quite large and offers 35-seat outdoor patio. While the decor is trying to make it look rustic and worn out, it needs a bit more breaking in before it will have that neighborhood pub feel. I don't mind either way though because I tend to focus on the food rather than the decor, but be warned that if you're looking for a quite evening meal, this is not the place for you. After 6 PM, the happy hour crowd is in full swing and it gets loud and boisterous. The cement walls don't help much with this either. Much to our liking here at D.C. Foodies, the menu concentrates on local ingredients for a majority of it's menu. Many of the pork products come from the local vendor, Eco-Friendly. In fact, half a pig gets delivered each week for use in the regular dishes on the menu like the cured pork belly, head cheese, and rilletes. The loin and shoulder cuts are used for other special dishes throughout the week as well. I can attest to the quality of the meat from personal experience at the local farmers' markets in Dupont and Arlington. The grass-fed beef is sourced locally from a farm in Maryland, and most of the vegetables come from farms local to MD, VA, and PA. The bar at CommonWealth boasts two cask-conditioned ales. You'll find two on the menu on the chalk board with a US pint being around $7.50, and an English pint running you around $8.50. If you're wondering what the difference is between a US and English pint, and English pint is roughly 1.2 US pints. I had a Victory Prima Pilsner on my second trip after the casks were finally ready. The beer lacks the bubbly texture of a typical keg beer, but was all flavor. The cask beer is served a little warmer too which allowed the flavor of the beer to come to the surface. So there are the facts...now lets see what we thought from our visits. I am a great fan of Great Britain's beers -- for casual drinking, you can have your extremely hoppy American IPAs; I'll take a bitter, please. This was reason enough to compel me to make the trek to Commonwealth, and to drag along a couple of good friends. The promise of cuisine based on deep frying only sweetened the deal. 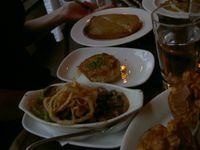 Since our party consisted of a good number of close friends, we wound up ordering a mish-mash of appetizers and entrees, and casually sampled a little of each. To describe everything I ate would take far too much space; suffice it to say the food ran the gamut from awesome to awful. 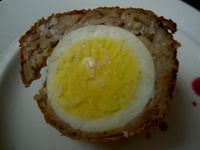 The scotch egg from the "Snack" menu and the "Butcher's Plate" pork belly were the two standouts in my mind. The former was crispy and flavorful, and came with a great selection of sauces, including a parsley/anchovy concoction that complimented the dish beautifully. The pork was subtlety seasoned and beautifully textured -- it is obvious that Commonwealth puts a lot of stock in the quality of their charcuterie, and I wish we had ordered more from this section. The biggest disappointments of the night were the Welsh Rarebit and the Yorkshire Pudding. These are both British treats I've enjoyed in the past, and I was rather let down with Commonwealth's dry, tough, flavorless offerings. I have a feeling that both were reheated, and therefore overcooked -- if such is the case, the chef still has a bit of work to do in the prep kitchen. Everything else was good, but forgettable in light of our fantastic apps. All in all, everyone was satisfied and completely stuffed. When the check arrived, and we found that we owed only about $50 per person, food AND drink included, no one found any reason for complaint. Loved: The fantastic quality of certain dishes, the warm and welcoming service, and the undeniable value per calorie consumed. Hated: The inconsistency between dishes, especially on those well known British classics. If I lived in the Columbia Heights neighborhood, Commonwealth would be my go to place for a pint and a bit of meat over a game of football (American or otherwise). If you are a fan of British fare, I heartily suggest you visit, as you are unlikely to find anything more authentic in the DC area, especially at so reasonable a price. That said, if you are not an ardent Anglophile, I cannot advise you go too far out of your way yet, as the food is a little inconsistent still. Shortly after I received the press release about the soon to open CommonWealth, I found out that the chef de cuisine would be none other than Antonio Burrell, previously of Viridian in Dupont Circle and Eleventh Street Lounge in Arlington. I've been a big fan of Antonio Burrell as he's not only an amazing chef, but he's also been a frequent commenter on DC Foodies. I eagerly awaited the opening of the restaurant and I had the opportunity to make two separate trips, both with significantly different outcomes. On my first trip, I stopped by without reservation on shortly after opening day with a friend of mine. The service was warm and embracing and the food exactly what I expected. Our server made a point to make sure that our questions about the dishes were answered. I had the bangers and mash with onion sauce. 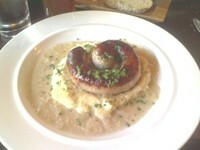 The dish only came with one large sausage, but the sausage was juicy and perfectly cooked with great flavor. 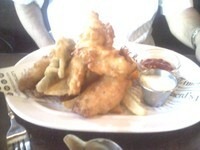 My friend also had the fish and chips which was crispy but not over fried and and the chips (or fries) were crispy as well. While I know that's not "traditional", I despise oily chips. You can also order sides of chips for $5 with cheese and/or gravy for an extra $2 each. While that might sound a little steep, I think they're worth it. The other starters or "Snacks" range from $5 to $13 and tend to be expensive for the portion size. On my second trip, I went with a much larger group of people later in the evening. We were a party of 8 with two children. Suffice it to say, service was not as smooth as I would've liked between dishes that we ordered not coming out at all and dishes coming out cold, but I chalk that up to the size of our party and how soon it was after they opened. I had a roasted veal sweetbreads special that was slightly inconsistent at $23. The sweetbreads were perfectly cooked and tender on the inside, but the prawns that came with it were small and dry. My friends oyster pie was only lukewarm, but a couple of people in our party recently from England said they thought the food was very authentic. Beer selection is still growing. When I was there last, all of the taps were not completely installed, but they still have a good selection of US and British tap beers. Beers by the bottle tend to run on the expensive side for my taste, especially the imports. 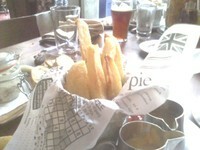 Loved: Great local food at reasonable prices; two available cask ales; good cheese selection. Hated: Inconsistencies in the service of the food; expensive "Snacks", pricey beers by the bottle.